Interested in spending your summer meeting amazing culture bearers in your community? Get paid to record oral histories this summer. Below, please find the application, instructions and program description for the California Story Scholars Program. This program is made possible with support from Cal Humanities, a non-profit partner of the National Endowment for the Humanities. Visit http://www.calhum.org. To apply to the South Asia Story Scholars Program, please go here. Citizen Historians are given priority! Click to train now! You are encouraged to become a Citizen Historian before applying: Citizen Historians who have trained online and conducted an interview will be given priority consideration for the scholarship program. Last date for applications: March 31, 2015 at 11:59pm Pacific Standard Time. June 2016: Attend training sessions in Berkeley, CA, meet project advisers and Archive staff. 10 hour commitment total during February. July 1 - August 31, 2016: Oral History collection field work (record and submit 25 Interviews). Story scholar may complete field work early. Full time commitment, i.e. the Scholar is expected to devote 100% of their time to recording stories, until completion of 25 interviews. September 1 - Decmber 30, 2016: Work with Archive staff, project advisers and local museums in curating select interviews for display at a Voices of Partition event in California's Central Valley. >>CALIFORNIA STORY SCHOLAR PROGRAM - Full time commitment for 2 months. 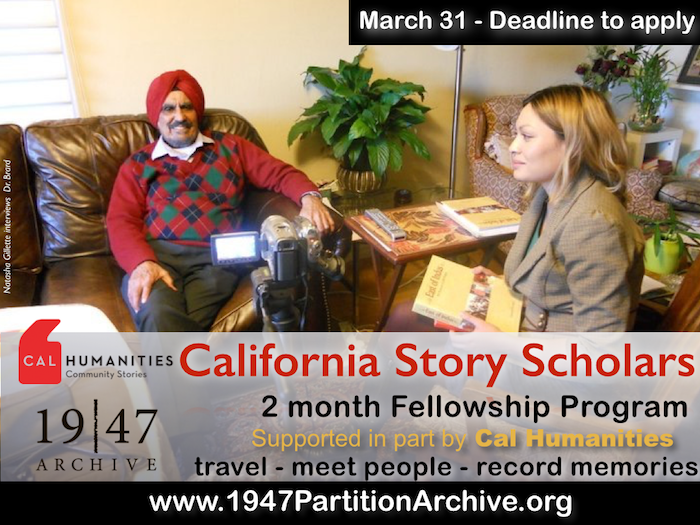 Commitment: The Story Scholars program is a full time commitment that requires that the individual focus their complete time and energy for a 2 month period to recording oral histories of Partition witnesses. In addition, prior to and following the two month full time scholarship field work period, shorter time commitments are required for mandatory trainings and post field-work story processing. What Scholars can expect? Scholars will receive relevant training, fieldwork experience and field equipment. Beginning June, scholars will receive comprehensive personalized feedback on work submitted prior to scholarship as a Citizen Historian, and relevant field training and instructions of scholarship period. Scholars will be required to travel to Berkeley, CA for one complete day during which time they will meet and interact with Archive staff, attend instructional sessions and have the opportunity to meet with or communicate with program advisers. In addition, Scholars will be expected to review training materials and complete pre-field work preparations on their own time in June. Beginning July, Scholars will travel to the homes of Partition witnesses in their chosen region and record oral histories. If required, scholars are responsible for all lodging costs in their region. However, The Archive will work with Scholar in identifying host families or other venues that will offer subsidized or cost-free lodging to Scholar. Though public transportation may be sufficient in the San Francisco Bay Area, a personal vehicle would be necessary for scholar to travel within the Central Valley region. Scholars are expected to record 25 oral histories over a two month period. Scholars are responsible for all transportation costs with the exception of travel for training costs in June. Scholars may complete the recording early (in less than two months) if the Scholar's personal schedule requires it. All equipment shall be returned by the Scholar to The Archive upon completion of the field work period. Scholar is responsible for the cost of replacing damaged equipment. Scholar may choose to use personal equipment. Story Scholars' work will be published and widely distributed through The 1947 Partition Archive website, social media and via other media collaborations. Scholars may refer to all oral histories recorded during the fellowship period for future academic and institutional research projects, in which they are named the primary researcher. Comfort traveling long distances by car/personal vehicle. Scholar is responsible for access to transportation such as a personal vehicle. Extensive travel may be required in recording stories especially in California's Central Valley. Scholar is responsible for access to adequate mobile communications device (such as a phone) for sending/receiving text messages, calls and other forms of communication. Scholar is required to maintain bi-weekly contact with digital Archivists in Berkeley. With the exception of travel for the training in June, Scholar is responsible for all transportation and lodging costs incurred. A stipend is provided to offset travel costs. Record 25 stories and submit all accompanying materials, including video files, release forms, post interview documents and photographs. Masters degree preferred, but upper class (junior and senior level) Bachelors students in good standing, will also be considered. Note: Scholars may supplement support provided by The 1947 Partition Archive via additional grants or other institutional funding, including but not limited to graduate or other academic research stipends. July 1, 2016 ($500): Upon completing of required training in June, Scholars will receive first dispersement of scholarship stipend in the amount of $500.00. August 2016 ($1500): Upon completion of first month and recording 13 stories, Scholars will receive second dispersement of scholarship stipend in the amount of $1500.00 no earlier than August 1, 2016. September 2016 ($750): Upon completion of recording and submission of all 25 stories, Scholars will receive last installment of scholarship stipend in the amount of $750.00, no earlier than September 1, 2016. December 2016 ($250): Upon completion of Voices of Partition events and completion of all program requirements.